A page from my No Excuses Art Journal. A few birdy portraits! The Ruby-throated Hummingbird showed up for the first time this year in the garden last weekend. I have a resident pair of Cardinals and I saw the Cedar Waxwing at Tall Cypress two weekends ago. Looking great! I love how each bird exudes a certain character. Those are absolutely beautiful! You are truly talented. These are soooo beautiful!! I love them!! Thanks Gina! I couldn’t have done it without your watercolor class! I absolutely adore your birdy portraits! 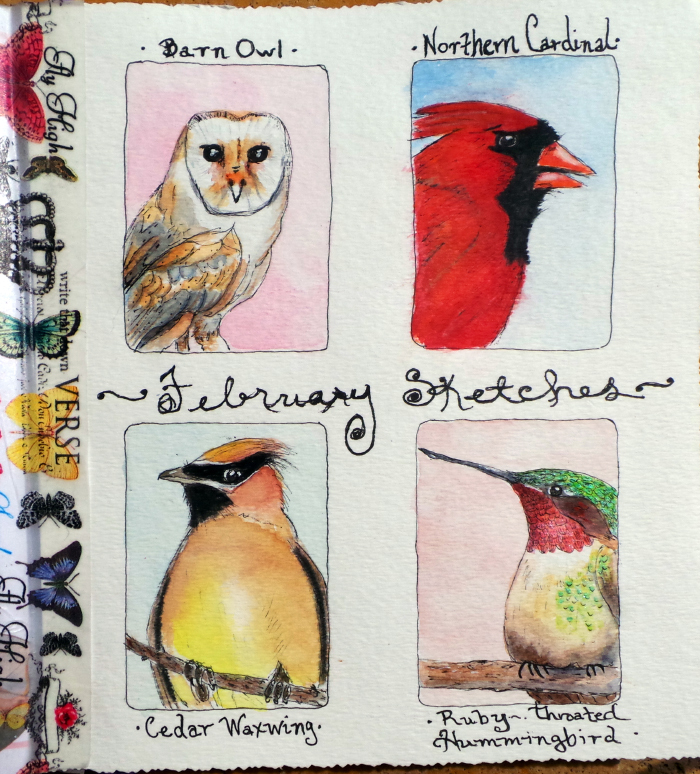 I am a new-ish birder and I started keeping an illustrated life list- it helps so much with memorizing the birds. I just came back from the Florida Gulf and added about 15 birds to my list- I’ll be posting pictures on my blog! That’s awesome! If you come to South Florida let me know and I’ll take you to all the hot spots for birding! It’s always more fun to bird with someone! definitely.. thanks for the invite!